Are the American people obsolete? Have the American people outlived their usefulness to the rich minority in the United States? A number of trends suggest that the answer may be yes. In every industrial democracy since the end of World War II, there has been a social contract between the few and the many. In return for receiving a disproportionate amount of the gains from economic growth in a capitalist economy, the rich paid a disproportionate percentage of the taxes needed for public goods and a safety net for the majority. In North America and Europe, the economic elite agreed to this bargain because they needed ordinary people as consumers and soldiers. Without mass consumption, the factories in which the rich invested would grind to a halt. Without universal conscription in the world wars, and selective conscription during the Cold War, the U.S. and its allies might have failed to defeat totalitarian empires that would have created a world order hostile to a market economy. Globalization has eliminated the first reason for the rich to continue supporting this bargain at the nation-state level, while the privatization of the military threatens the other rationale. The offshoring of industrial production means that many American investors and corporate managers no longer need an American workforce in order to prosper. They can enjoy their stream of profits from factories in China while shutting down factories in the U.S. And if Chinese workers have the impertinence to demand higher wages, American corporations can find low-wage labor in other countries. This marks a historic change in the relationship between capital and labor in the U.S. The robber barons of the late 19th century generally lived near the American working class and could be threatened by strikes and frightened by the prospect of revolution. But rioting Chinese workers are not going to burn down New York City or march on the Hamptons. What about markets? Many U.S. multinationals that have transferred production to other countries continue to depend on an American mass market. But that, too, may be changing. American consumers are tapped out, and as long as they are paying down their debts from the bubble years, private household demand for goods and services will grow slowly at best in the United States. In the long run, the fastest-growing consumer markets, like the fastest-growing labor markets, may be found in China, India and other developing countries. This, too, marks a dramatic change. As bad as they were, the robber barons depended on the continental U.S. market for their incomes. 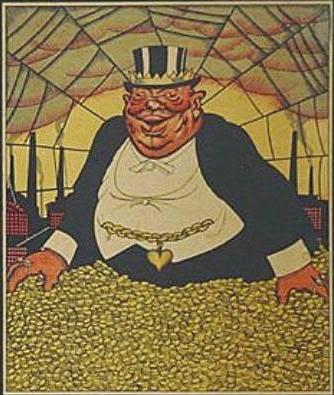 The financier J.P. Morgan was not so much an international banker as a kind of industrial capitalist, organizing American industrial corporations that depended on predominantly domestic markets. He didn't make most of his money from investing in other countries.